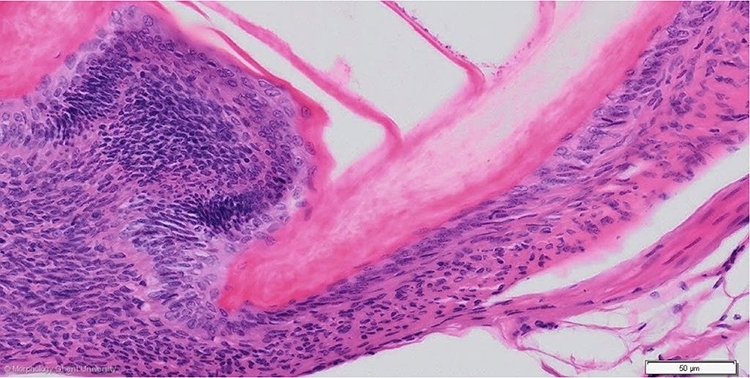 In resting stage, the dermal papilla consists of a basal zone of rounded cells and an apical zone of flattened cells. The basal zone is continuous with the outer layer of the dermis of the follicle, the apical zone is continuous with the inner layer of the dermis of the follicle. The dermal papilla, the epidermal covering of the dermal papilla and the epidermal collar (the transitional zone between epidermal covering of the dermal papilla and the epidermis of the follicular wall) constitute the feather blastema out of which a new feather will develop.